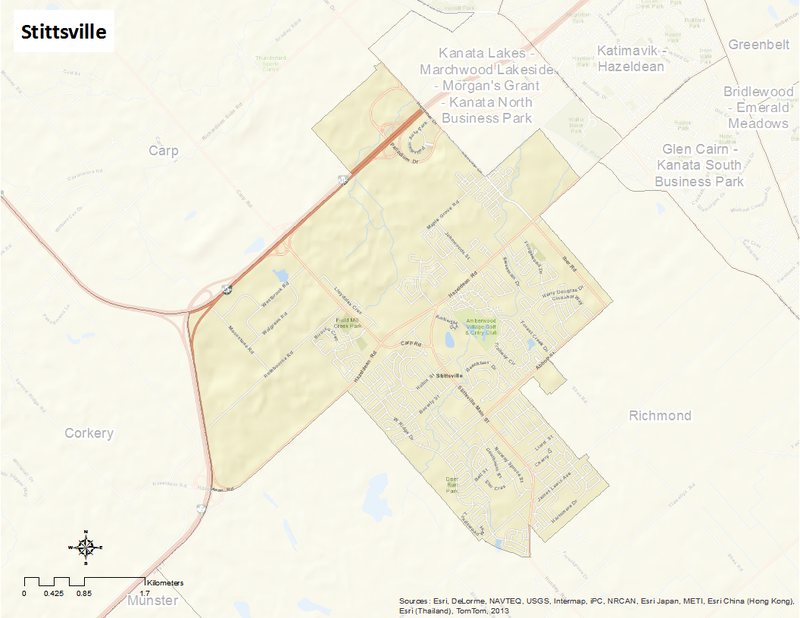 Stittsville is bounded by Huntmar Road on the north, Hartsmere Drive on the south, Iber Road, Caribou Avenue, Liard Street, and Shining Star Circle to the east, and Sirocco Crescent, Smoketree Crescent, Whalings Circle, and West Ridge Drive to the west. Stittsville’s first settlers arrived circa 1820. It was not until 1850 that the town was established (and named after) by Jackson Stitt, the town’s first postmaster. The community was originally located near the area of Hazeldean and Carp Roads, but after being destroyed by fire in 1870 it was decided that the town would be better located further south, closer to the newly constructed railroad. It was declared a village in 1961 and in 1974 it was incorporated into Goulburn Township. Eventually in 2001, like most areas in and around the National Capital Region, it was amalgamated into the City of Ottawa.